At Gallardo Law Firm, a personal injury lawyer can get you the justice you deserve. Here is a basic break down for personal injury cases and what we can do for you. It is the duty of a personal injury lawyer to get monetary compensation for client losses, such as lost wages, medical bills, and pain and suffering. A personal injury lawyer has the experience necessary to practice personal injury law in Miami, and they are prepared to fight to protect their clients’ rights in civil court. Take the first step in receiving the help you deserve, and contact us today. Gallardo Law Firm is dedicated to assisting individuals who have been injured in an accident to claim the benefits they are entitled to receive with a personal injury lawyer. All our efforts and devotion are used to represent our clients. Equipped with skilled personal injury lawyers and litigators, we have effectively prosecuted claims related to bodily injury for countless of individuals in Miami who have suffered both physical and emotional adversity caused by carelessness, recklessness, neglect, and occasionally, a premeditated offense. The personal injury lawsuits are filed by those individuals claiming injuries caused by an accident due to the negligence or wrongful conduct of another person or entity. Depending upon the intentional or neglectful infliction of the party responsible for the damage, the other party may be assigned to monetary compensation. The amount of compensation our personal injury lawyer may guide you to acquire will be determined by the severity of the injury. The injuries that receive higher settlements in these types of cases are those of broken bones, brain damage, and severe limb damage(s). The compensation will be obtained through a settlement agreement or a judgment after a trial. Where to File a Civil Lawsuit? In the state of Florida, one is required to file an injury claim in the county where the accident took place. When it comes to claims worth more than $15,000, jurisdictions apply at circuit courts in Florida. In county court, you will not be paid more than that amount. The discovery is the procedure that is performed before the trial in which both parties request and discloses the records, information, testimony, and documents related to the accident. During the process of discovery, a personal injury lawyer will share information about the injury lawsuit. In many cases, this information has helped to settle the case out of court through mediation instead of going to trial. There are different ways to obtain evidence. Interrogatories, for example, are questions sent from one party to the other one to be answered under oath and sent back within a certain amount of time. Request for production is another way to obtain evidence such as records, reports, and bills to be available to the opposing party counseling. There are certain facts that one of the parties requests for admission under oath. This means that such facts are enough evidence to prove the case at the trial. This is called a Request for Admission, and they have to be answered in a short period of time, or they will not be considered by the other party. Deposition takes place out of the court in which the litigant, the offender, the witness or someone else involved in the case is scrutinized by the conflicting party under oath. This proceeding will allow the lawyer to know what the witnesses are going to say in the trial; therefore, they could use it to contradict them. Independent Medical Examination consists of the testimony of the health care professionals taking participation in the case. They will tell the jury if the injury suffered was related to the accident in which the parties were involved. Several types of injuries will require consulting a personal injury attorney. The skills of an experienced personal injury attorney come in handy when dealing with an accident. A personal injury lawyer can develop resources that will be useful when proving your case in court. He or she can convince insurance company executives to stop harassing you and move the process forward in a timely fashion. You will also have someone who can advise you on what to do or to say so that you do not jeopardize your case. Sometimes, the claims adjuster tells you the truth when he or she says that you would not be able to obtain a higher settlement in court. However, you will not know that this is a statement of fact until you hire a personal injury lawyer, preferably in your local area. A local injury lawyer is familiar with the civil courts in your area and will know what to expect from the judges. An injury lawyer who has experience litigating is the best option. Firms such as Gallardo Law Firm have already represented several clients. Also, a personal injury lawyer is knowledgeable about personal injury laws. A personal injury lawyer will have several important contacts that he/she can call upon to help with your case. Car Accident: Car accidents can result in catastrophic injuries, including broken bones/fractures, disfigurement, and spinal cord injuries, and they entitle sufferers to monetary damages. Work-Related Injury: Employees who work on nautical vessels have the right to sue the responsible parties if they sustain injuries on the job. Negligence in nursing homes: Corporations that run nursing homes must adequately supervise their employees to ensure that their patients are safe, or they can be held responsible for injuries. Lack of diagnosis or Misdiagnosis: Medical professionals who fail to diagnose an illness and treat it correctly can be held liable for patient injuries. Pharmaceutical Injury: Pharmaceutical manufacturers have marketed drugs to the public that they knew were dangerous and were required to pay large settlements. Surgical Error in Hospitals/Medical Malpractice: Surgeons and hospital personnel can be held liable for failing to provide patients with the level of care that is expected in the area. OB/GYN Errors: Parents are entitled to sue medical professionals who made errors during delivery that resulted in injury to the child. Wrongful Death Cases: When someone dies in an accident that someone else’s negligence caused, his or her survivors may be entitled to a settlement. Slip and Fall: Owners of commercial and private properties must ensure that customers and guests will be safe on the premises. If not, they can be sued for negligence. School and Daycare Injuries: A total of 200,000 children are hurt on school and daycare playgrounds every year, and personal injury attorneys hold these entities accountable for their negligence. Assault, Abuse and Other Felonies: Personal injury attorneys protect the rights of crime victims by offering them another way to make those who hurt them pay for their actions. What Can You Expect From Your Personal Injury Lawyer? A personal injury lawyer will visit the scene of the accident to determine who caused it. If the investigation takes place right after the accident transpired, your lawyer will be able to take pictures and gather evidence. If you were involved in a car collision, your attorney will photograph damage to the vehicles. Your personal injury lawyer will also document the progress of your injuries on a regular schedule to demonstrate how the wounds are healing. Photographs are much more valuable than your testimony because they give the jury a visual representation of your pain and suffering. Your personal injury lawyer will remain in contact with your doctors to obtain your medical records when needed. If you had the opportunity to write down the witnesses names, your lawyer will be able to review their statements with them. Finally, an injury lawyer will make sure that he is familiar with local laws. When an injured party formally requests payment for his or her injuries from the at-fault party’s insurance company, the injured is said to have filed a “personal injury claim” In the best case scenario, the matter ends after successful negotiations between the injured party and the at-fault party’s insurance company. When this occurs, the adjuster and the injured party are both happy with the settlement. When things cannot proceed as smoothly as was described above, your personal injury lawyer will file a personal injury lawsuit. This may be the best course of action if the adjuster continues to deny that you were seriously injured. This leads to settlement offers that are much too low to cover your medical expenses. The answer is to file a lawsuit in civil court that will be tried in front of a judge or a jury. Damages in personal injury cases are generally classified as “compensatory,” which means that they serve to compensate the person injured for the lost caused by the injuries or accident. Compensatory awards help the injured plaintiff monetarily. However, pain and suffering as we all know doesn’t have a monetary value. Having physical limitations lingering from an accident can be very limiting and stressful. That’s why it’s wise to seek the counsel of a workers compensation lawyer. Pain and suffering: You will get compensated for any severe discomfort caused by the accident or any ongoing pain afterward. Lost wages: You may receive compensation when the accident impacts your salary and wages, not only the income already lost but also your future salary. Medical expenses: It’s important to cover the cost of medical bills associated with the accident. Personal injury damages include reimbursement for any treatment you already received and medical care you may need in the future. Property damage: When vehicles, clothing and other items are damaged as a consequence of an accident you will most likely receive compensation. Mental suffering and emotional trauma: You may also be compensated for any psychological impact caused by the accident. Emotional distress can manifest in fear, sleep loss, and anxiety. Loss of Consortium: This relates to the impact injuries have on a relationship. In some cases, it could relate to the inability to maintain a sexual relationship. Loss of Enjoyment: Some injuries may stop you from enjoying everyday activities such as exercise, hobbies, etc. If you qualify, you may be entitled to compensation for “pain and suffering” damages. If you win your case, the judge may award you damages to compensate you for the monetary losses you sustained due to your injuries. Compensatory damages cover medical bills and lost wages. If your capacity to earn a living is diminished, you could receive a sum of money to compensate you for this loss. Gallardo Law Firm can help you get the most out of your case. Punitive damages are meant to punish the defendant for acting badly and to discourage similar behavior in the future. For this purpose, juries have been known to award plaintiffs millions of dollars. The court determines the amount by comparing your suffering to the sum your personal injury lawyer believes you deserve to receive. Personal injury law involves the legal defenses and remedies in civil lawsuits that are filed by a private individual known as “plaintiff” against a person who is accused of contributing to the injury. Am I entitled to file a claim? You are entitled if you have been injured in an accident that was another person's fault and not your own via recklessness or negligence. Can I file a claim if I am partly to blame for the accident? Yes. You can still file a personal injury claim, with the help of a personal injury lawyer, even if you are partially at fault when the authorities assign a majority of the blame to the other party. Does it matter what type of attorney I hire for my personal injury case? Yes. 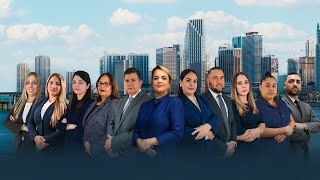 You must hire a Miami personal injury lawyer from a respectable firm such as Gallardo Law Firm if you have been injured or a loved one has died in an accident. What will I need to tell my lawyer about my case? The date that the accident occurred, who caused it, the location where it transpired, how it began, and what type of injuries you sustained, are all important questions you need to ask your attorney. The amount of time your case will take to be resolved will depend on the nature of your injuries and the facts of your case. Yes. The amount of compensation you receive will depend on whether your pain is minimal, moderate or severe. The statute of limitations is the amount of time that you are allowed to file a lawsuit against someone who hurt you. A Miami personal injury lawyer can help you determine the appropriate time limit for your particular case and will take legal action on your behalf within the established time frame. Who can sue in a wrongful death lawsuit? Florida's wrongful death statute makes it hard on individuals that have been affected by the death of a loved one to recover compensation for their damages and losses in this kind of lawsuit, except a skilled attorney is representing them. What if the person who caused an injury does not have insurance? Whenever possible, your attorney can collect damages beyond the available insurance. What Is It To File Suit? The client authorizes to proceed with the lawsuit when all other options have been spent. Can I get compensation for personal injury if I had some blame for what happened? In some areas, people cannot get compensation if the negligence did not contribute entirely to the injuries sustained. The majority of jurisdictions hold that the affected party can still receive compensation if they were part of the blame for the damages, which can result in a decrease of the amount in compensation to be awarded to the victim. This depends on what type of coverage is available and what kind of insurance the provider is accepting. Our office will be in contact with your medical provider and the insurance company to expedite the payment of your bills. We can also assist arrange financing alternatives to cover the bills. First, you should contact a personal injury lawyer to know your rights and options. Second, you need to call the police and report the accident. Third, you should report the accident to your car insurance. Do not discuss the accident with anybody but a doctor and your personal injury lawyer. It is also important to refrain from signing any settlement or statements to an insurance company.